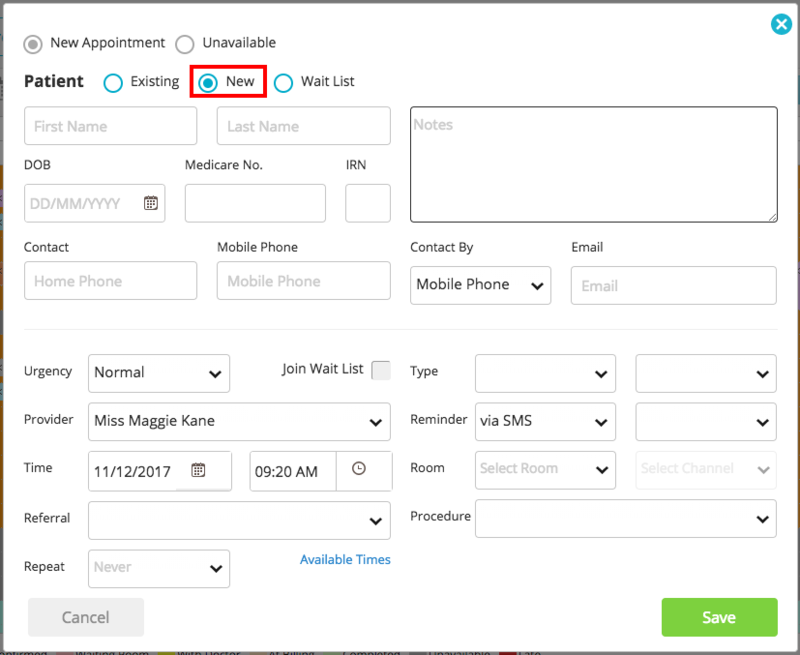 This article will cover how to add New Appointments for both New and Existing patients, and how to set time-slots in the appointment calendar to Unavailable. Click +Appointment from the Quicklinks bar anywhere in MediRecords. Click New Appointment from the Appointments tab. Click the Time-slot where you want to put the appointment from the Appointments calendar. Click on New Appointment from the Quick Actions bar in Dashboard in a Patient Record. 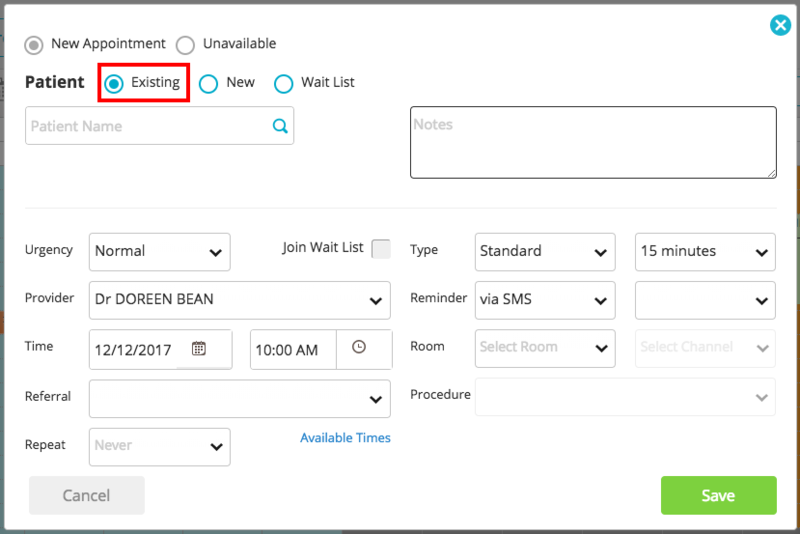 When opening a new appointment, the type of patient is "Existing" by default. MediRecords uses an advanced search engine for locating patients. You can perform searches based on any field displayed within the patient list grid (in the MediRecords Patients section). You can search for keywords in the patient's First or Last Name, Address, Gender, DOB, Age, and Home, Work, or Mobile phone number. *NOTE: If you are searching for a patient using the First and Last Name, remember to put a comma between each. 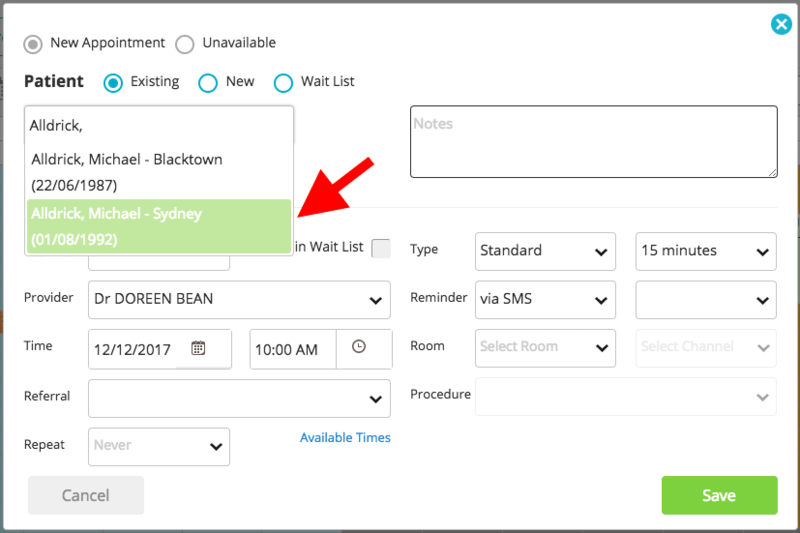 Click the Patient Name and complete the appointment with any appointment notes and required fields, then select Save. The appointment will now appear in the appointment calendar for the selected provider. To Add a New Appointment, click New Appointment, or click the Time-slot where you want to put the appointment. This will open the New Appointment Form. Click New to switch to the New Patient Appointment Form. 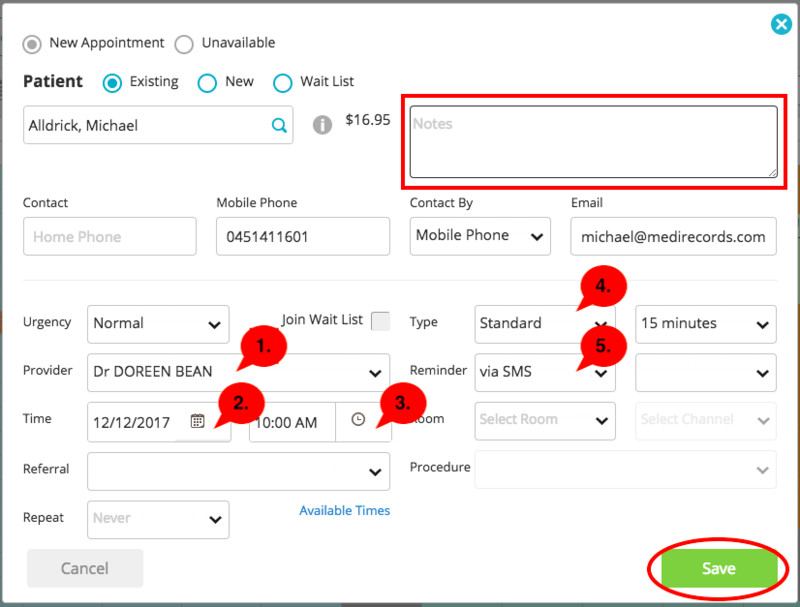 In order to create an appointment for a New Patient, the only Patient details that are required are the Patient's First & Last Name, DOB, and Primary Contact number. The other details like Address, Medicare No. etc. can be updated when the patient attends the clinic. Complete the new appointment form with all the required details, and click Save. Note: The list of available Appointment Types are sourced from your practice's available appointment types. Should you wish to add, edit, or remove items on this list, please speak with your practice manager. Note: SMS reminders can be sent instantly or up to 7 days prior to the scheduled appointment. SMS messages will only be sent if you have available SMS credit and patient has a valid mobile contact number listed. Once configured for X Days Before, the reminder will be sent on the corresponding day at 4:00PM AEST (or 5:00PM AEDT). The appointment for the New Patient will now appear in the appointment calendar for the selected provider. A new patient record has also been created. Additional patient details can be added when the patient attends the clinic. You've completed another MediRecords Tutorial. 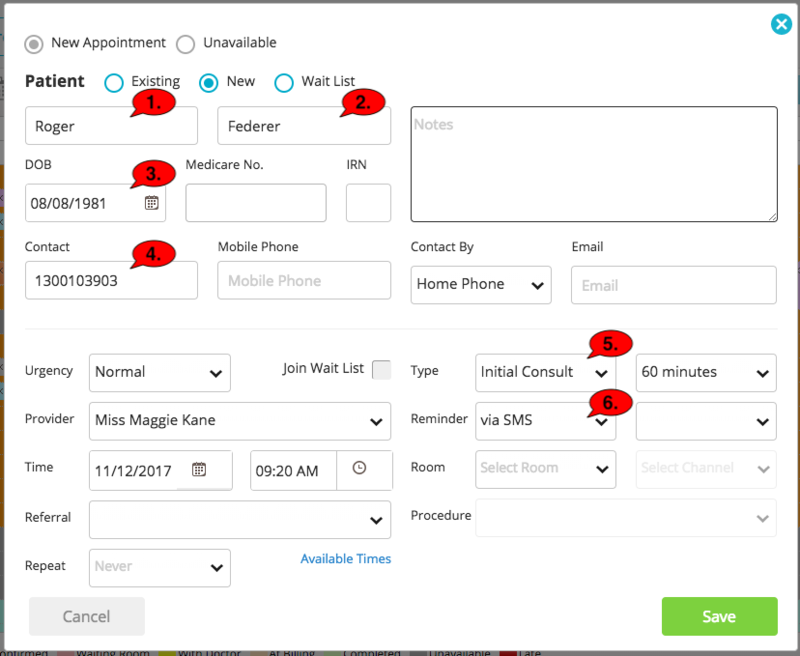 You should now be able to create an appointment for new and existing patients. If this is not what you're looking for, head back to our knowledge base and search for another article.